The 19th century was a period of railway expansion and a map of the railways of England around the middle of the century showed a spiders web of tracks. There was great competition between the many different owners of railways and one of the reasons for the Bishops Stortford, Dunmow and Braintree railway being built was to stop other railway companies from getting into East Anglia. Dunmow was in an ideal position for that to happen, being at the crossroads of Stane Street which ran from St Albans to Colchester and the main through road from London to Bury St Edmunds and beyond and there had already been speculation from other rail companies on building new routes through Dunmow. In 1859 a group of businessmen based in Sawbridgeworth and Bishops Stortford first had the idea of building the line based on the growing demand in London for agricultural produce. 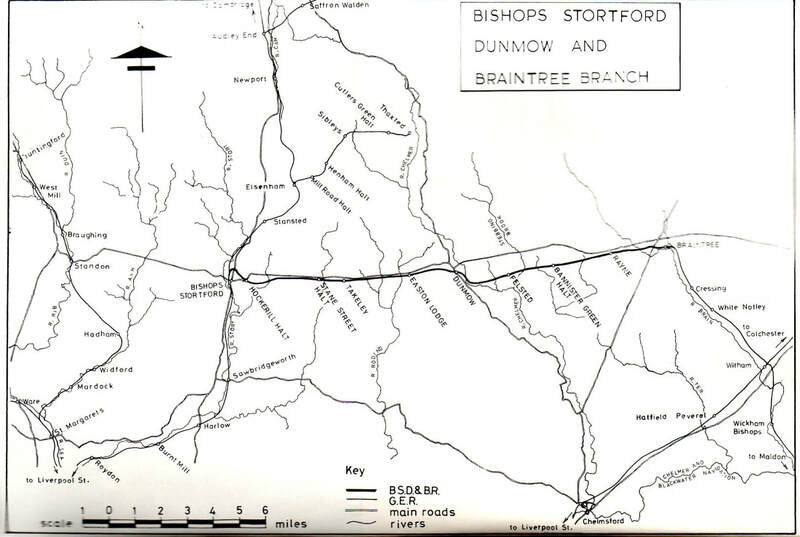 Eastern Counties Railways were interested in the scheme and knew the area as they had previously built the lines through Bishops Stortford and from Witham to Braintree in the 1840's. A Bill was put before Parliament in May 1861 and the following month saw the Bishops Stortford, Dunmow & Braintree Railway Company being incorporated by Act of Parliament. Five years were given for the line to be built with a branch line also being built between Dunmow to Epping. A series of public meetings to get local support for the line and to attract investment took place at various places along the route. At one of the meetings it was stated that if the line was not built, a rival London to Bury St Edmunds via Dunmow route would succeed. The consequence of that happening would result in Braintree being bypassed with a substantial loss of trade in and around the town. Difficulties in attracting investment were encountered and there was a general lack of local interest in the proposed branch line. In 1862 the newly incorporated Great Eastern Railway (GER) took over the financing of the line and agreed to purchase the railway outright on completion. A contractor was engaged, the line of the track was surveyed and endless discussions on financial matters took place before a date to start the work was finally agreed. That took place on 24th February 1864 at a site on New Street, Dunmow with the day being declared as a public holiday in the town. ​A grand procession through the town took place with bands playing and buns and oranges distributed to the watching children. The ceremonial turning of the first sod was performed by Lady Justina Augusta Henniker, a local dignitary. The serious celebrations took place later in the day with a sumptuous meal and concert followed by a grand ball in the Saracen's Head. Around 300 navvies were taken on and began working on the project almost immediately, starting at the Stortford end.​ Much of the major work had been completed on schedule by the end of 1865 but as the project dragged on through the following year, the time the work was taking had exceeded the five years given under the Act of Parliament. A Board of Trade inspection of the line in November 1866 made a number of recommendations and decided that a certificate could not be issued until the outstanding work was completed. Completion of that work together with lengthy arguments over settlement of bills by GER meant that a further inspection didn't take place until February 18th 1869. Although some deterioration of the completed track had taken place since the 1866 inspection, most of the required work had been done. The branch line, consisting of 14 over-bridges, 18 under-bridges and 1 viaduct, was passed as satisfactory and permission to open the line to traffic was finally given 2 days later. As part of the contract, both Bishops Stortford and Braintree stations had been rebuilt and four intermediate stations were built, at Takeley, Dunmow; Felsted and Rayne. When it was built, Felstead station was spelt with an 'A', probably due to a clerical error, and it was only in 1952 that the spelling was changed to match the village name. ​​Dunmow was the biggest of the stations on the branch line with 2 platforms for passengers, goods sheds and several sidings. Haslers corn mill and the Dunmow Flitch bacon factory were located adjacent to the station. 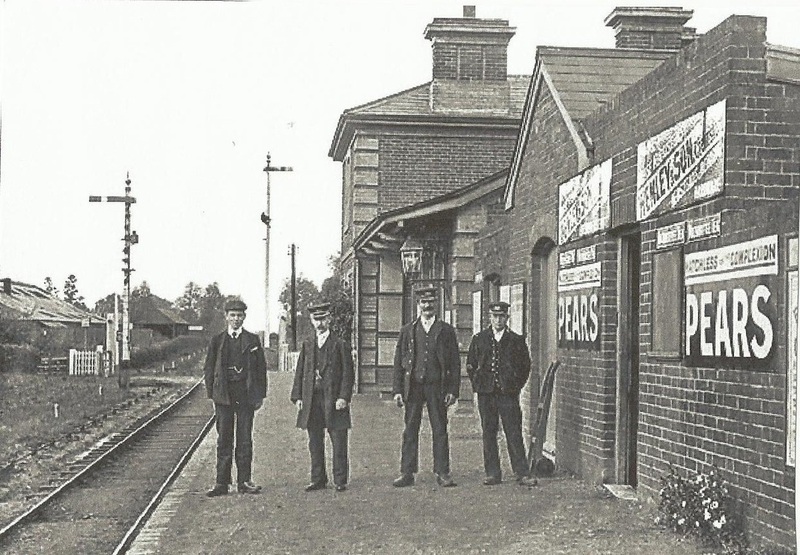 Another indication of the size of Dunmow station was that 18 staff were employed there prior to World War 1, compared to 6 or 7 at the other stations on the line. ​The first passenger train left Braintree at 7.00am on Monday 22nd February 1869. Local people had long since become fed up with the lengthy delays in opening the line and that, combined with the wintry weather on the day, kept passengers and spectators to a minimum. It soon became apparent that costs had been grossly underestimated, the final cost of building the branch line coming to £188,779, a considerable sum in those days. All stations had extra capacity added to them in the early years of the line due to the increasing volumes of freight being carried. Bishops Stortford had its goods yard extended, as did Braintree station which also had stables built. Takeley, Felsted and Rayne stations had sidings added and a cattle dock was provided at Rayne, the base of which remains. Rail traffic on the line was originally controlled from signal boxes at either Bishops Stortford or Braintree but the volume of freight being carried meant that new signal boxes needed to be added at each station. As well as freight traffic to begin with, there were 2 passenger trains daily, later increased to 6. The early passenger carriages had no heating system so water-filled foot warmers were introduced towards the end of the century. These were stored and refilled in a small foot-warmer house at Braintree station. There is no information on how the system worked but it was probably First Class only! Incidentally, vandalism is nothing new and there are reports from 1878 of stones being thrown at a railway carriage from the bridge at Takeley, breaking a window and hitting a passenger. Sleepers were also placed across the track near Felsted and Dunmow. After much campaigning by the Earl and Countess of Warwick, a Halt or request stop was built at Little Canfield in 1894 and named Easton Lodge. Although it could also be used by local passengers, the prime purpose of the Halt was for the benefit of house guests visiting the Earl and Countess. Ramsay Macdonald and King Edward VII were regular visitors. The Countess agreed to pay £52 per year for 10 years towards the upkeep of the station but that arrangement subsequently lapsed in 1898 when the Countess refused to pay. ​ In 1910, Hockerill Halt was built in the centre of the newly formed Bishops Stortford Golf Club. This was at the request of the owners who saw it as a way of encouraging new members. ​Goods traffic on the line continued to grow, consisting mainly of agricultural products for the London markets but also as a result of the expansion of industry in Braintree. The number of passenger trains was reduced in 1916 and 1917 due to wartime restrictions and further problems arose from the General Strike in 1919. That industrial action and the General Strike of 1926 began the decline in railway services when businesses began to realise that goods could be transported more efficiently by road, often at better rates than GER were charging. Additionally, the introduction of a bus service after the war between Dunmow and Bishops Stortford started to make inroads into the number of passengers using the branch line service. As a means of regaining or retaining foot passengers, GER built 2 further Halts in 1922, at Stane Street, next to Hatfield Forest and Bannister Green near Felsted. Passenger carriages were adapted for the Halts with a drop down set of steps operated from inside by the conductor-guard. January 1923 saw GER merging with several other companies to become London & North Eastern Railway. A regular bus service between Braintree and Bishops Stortford began to be operated by Hicks Brothers of Braintree shortly afterwards which had a further adverse effect on passenger numbers. While the number of passenger trains on the line was reduced during World War 2, freight traffic grew as a result of the war. The line was used to transport thousands of tons of rubble for the construction of Saling airfield and later when it became operational, massive loads of bombs were carried under cover of darkness. USAF bases at Stansted and Easton Lodge were also regularly supplied with armaments and stores via Bishops Stortford and Takeley stations. After the invasion of Europe in 1944, the line was used by specially built ambulance trains transporting wounded servicemen from Parkeston Quay and Harwich to Hockerill Halt for Bishops Stortford Hospital and to Cressing for Black Notley. When Nationalisation took place in 1948, the newly formed British Rail began to take a long hard look at all the rural services it had inherited. Statistics kept by BR showed that in November 1951 7,500 passengers had travelled by bus between Bishops Stortford and Braintree while only 630 had gone by rail. Despite often acrimonious discussion and local objections to the closure plans, a decision to close the branch line to passenger traffic was made and the last scheduled passenger train to run was the 8.15pm service from Bishops Stortford on 1st March 1952. ​Although the scheduled passenger service between the towns had ceased, one service which continued was our forerunner to the Hogwarts Express which carried Felsted School pupils to and from Liverpool Street at the beginning and end of each term. Other than some special excursions which continued to 1964, steam engines ceased to operate on the branch line in 1962, diesel-electric locomotives having been introduced in 1959. Freight traffic continued, however, with the sugar beet factory at Felsted which had opened in 1926 being probably the main customer for the line. The Geest banana ripening factory at Canfield opened in 1962 and was the other major user of the line but the 1960s saw an increasing move from rail to road transport as it offered a door to door service and avoided double-handling of goods. In 1966, Dunmow viaduct was declared unsafe and closed to rail traffic, with an estimated repair cost of £120,000 which BR were not prepared to pay. That left 2 separate sections of track, Bishops Stortford to Dunmow and Braintree to Felsted. This inevitably provided a poorer service to the 2 main users of the line. Sugar beet traffic ceased in 1968 and bananas in 1970. That loss of business was the death knell for the branch line. A final enthusiasts train ran between Bishops Stortford and Easton Lodge on 27th July 1972. All sections of the track and fixtures were lifted between 1970 and 1972 and Dunmow viaduct was demolished in 1977. With the exception of Dunmow station, which was demolished in the early 1970s, all the other station buildings remain standing. Takeley belongs to Essex County Council and was occupied by one of the Rangers until recently. Easton Lodge and Felsted stations are owned privately and Rayne has been occupied by the Booking Hall Cafe since 2009. The Beeching Report of 1963 incorrectly gets blamed by many people for the closure of the branch line. Although he recommended closure of the line between Braintree and Witham, no such recommendation was made with regard to the Braintree to Bishops Stortford line. It was a decision made on economic grounds by British Rail. The land which formed the branch line was bought by Essex County Council in the 1980's as a possible route for an upgraded A120. When the eventual route was decided on, the Council took the decision to turn the land into a linear country park centred on Rayne Station. Threee Rangers were appointed, the route was partly re­surfaced and most of the station buildings were renovated with the upper part being used as living accommodation for the manager of the country park. The old ticket office was used as an office by the Park Rangers and a small museum was created off the booking hall. The Flitch Way Country Park was officially opened in 1994. The station was recently classified as a Grade II listed building. The Flitch Way and Great Notley Country Park merged in 2008 and the Rangers are now based in the Discovery Centre building at Great Notley. In 2004, a local couple asked Nigel Wood, one of the Rangers, whether they could cut back some of the bramble overhanging the path. He readily agreed and other interested users of the Flitch were encouraged to volunteer. From that small beginning, the Friends group came into being and became a registered charity the following year. You can read more about our charity in the About section. 2005 Most of the route surfaced to provide all year access. The Bishops Stortford Dunmow & Braintree Branch by P Paye, Oxford Publishing Co, 1981, SBN 86093 142 O. Branch Lines to Braintree by CP Lombardelli, Stour Valley Railway Preservation Society, 1979. Lost and Found: Journey to a Forgotten Railway by David Gridley, Slow Coach Publishing, 2016, ISBN 0956412815.